Dan and I went over to the east coast of Florida during the New Year holiday. 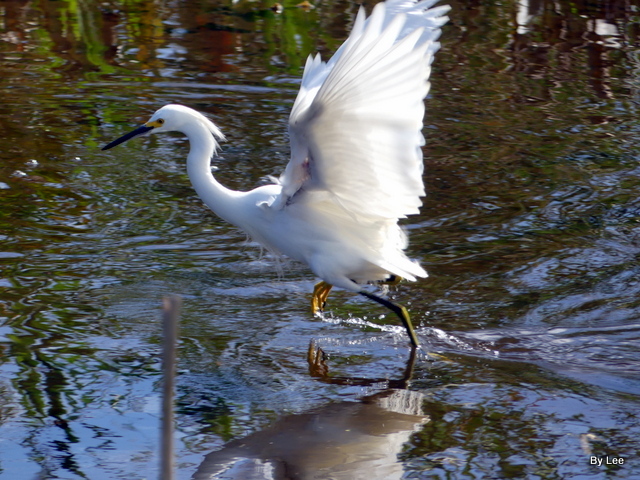 We were able to do some birdwatching at Viera Wetlands in Viera, Florida and also went to Merritt Island National Wildlife Reserve’s Black Point Dr. That is where I captured this Snowy Egret strutting with his yellow feet showing. 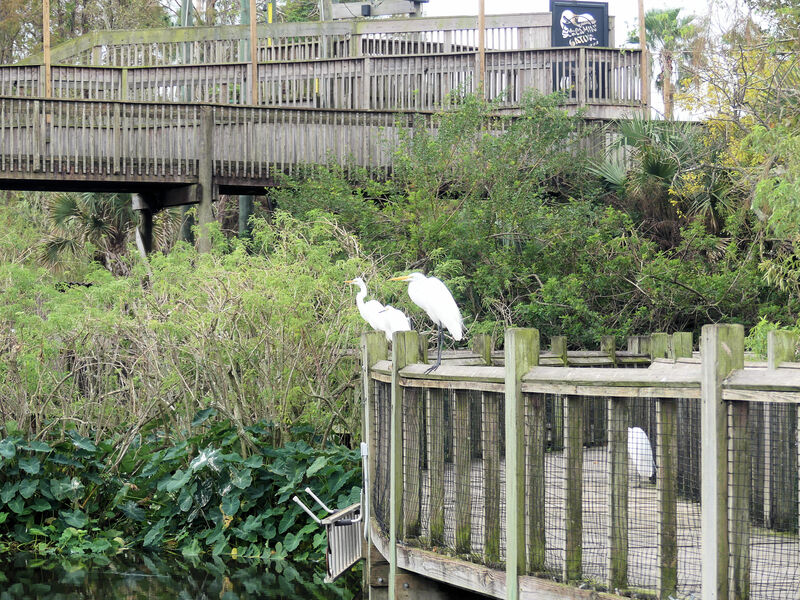 Also saw the Snowy Egrets at Viera. 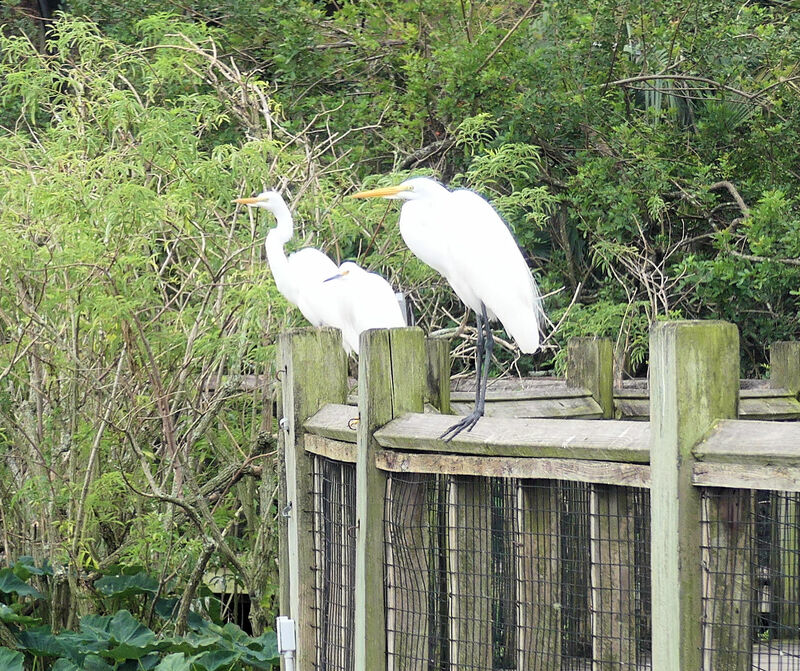 When we were at Gatorland a few weeks ago, I noticed two Great Egrets on the walkway rail. I zoomed in to get a better view of them. There were actually two Great Egrets and a Snowy Egret in between them. 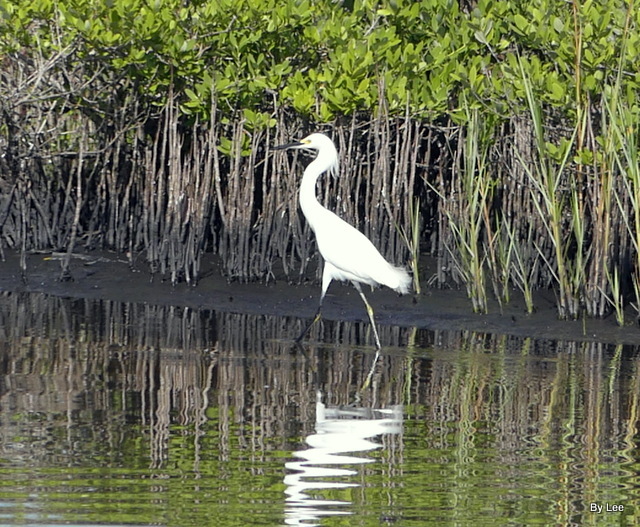 By the time we arrived at their location, one of the Great Egrets had flown off to check something out. 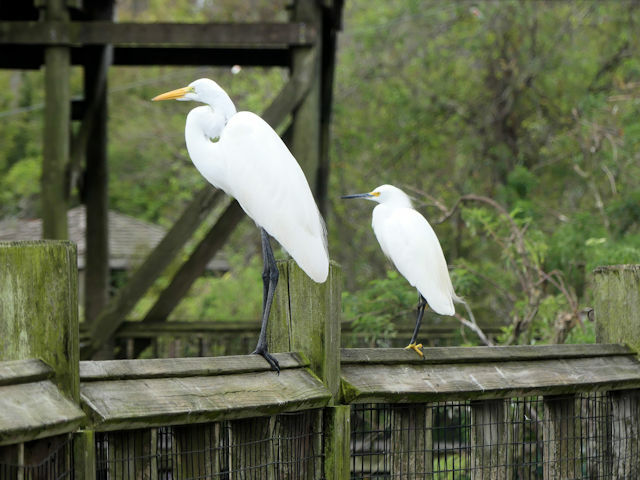 There sat the Great Egret and the Snowy Egret side-by-side. I thought maybe that Snowy was thinking he would like to be tall like this friendly Great Egret. 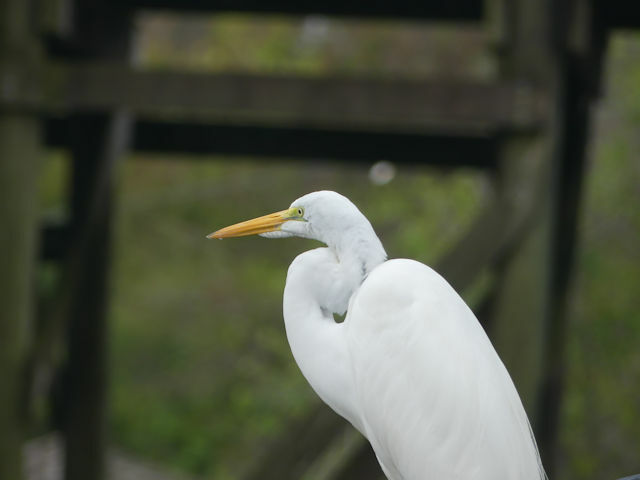 The Great Egret is tall and nice looking with his long yellow beak and black feet. The Snowy though shorter has a nice black beak and cool yellow feet. Knowing that the Lord created both of these fine birds, He made them just the way He wanted them. One tall, one short. One with a black beak and the other with a yellow one. 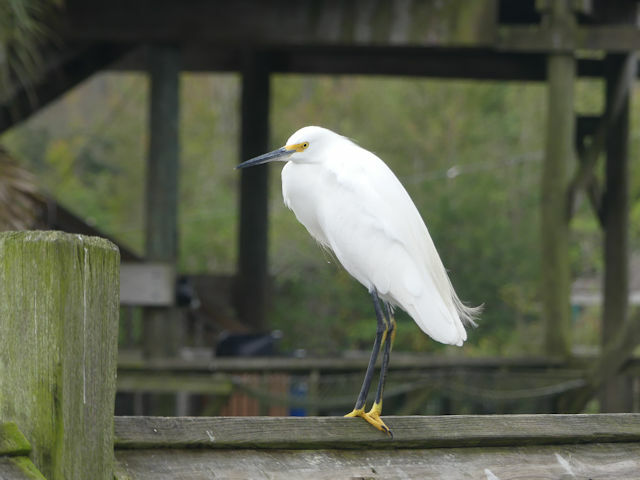 And He may have given height to the Great Egret, but He gave the shorter Snowy those neat yellow feet. Do we get envious and desire what someone else has? Maybe taller, more talented, sing better, etc? God has made us just the way He wants us, and has provided us with different bodies, talents, abilities, and directions to serve Him. Are we content with what He has given us? I am sure are Snowy Egret was not the least bit jealous or envious. 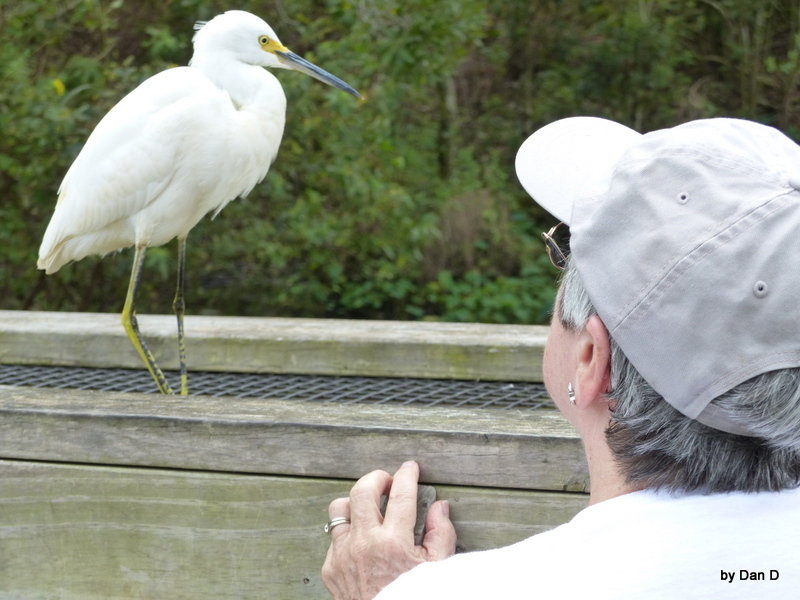 It is a blessing to use our heads, to watch birds, such as egrets. As noted in Part 1 of the “E” Birds “E” is for Eiders, Eagles, (of which there are many varieties), Eagle-owls, Egrets, Emus, Eagle-owls, Egrets, Euphonias, Elaenias, Eremomelas, Elepaios, Earthcreepers, and Emerald hummingbirds — plus whatever other birds there are, that have names that begin with the letter E.
In this Part 2 (reviewing “E” birds), 2 categories of “E” birds are considered: Egrets and Emus. 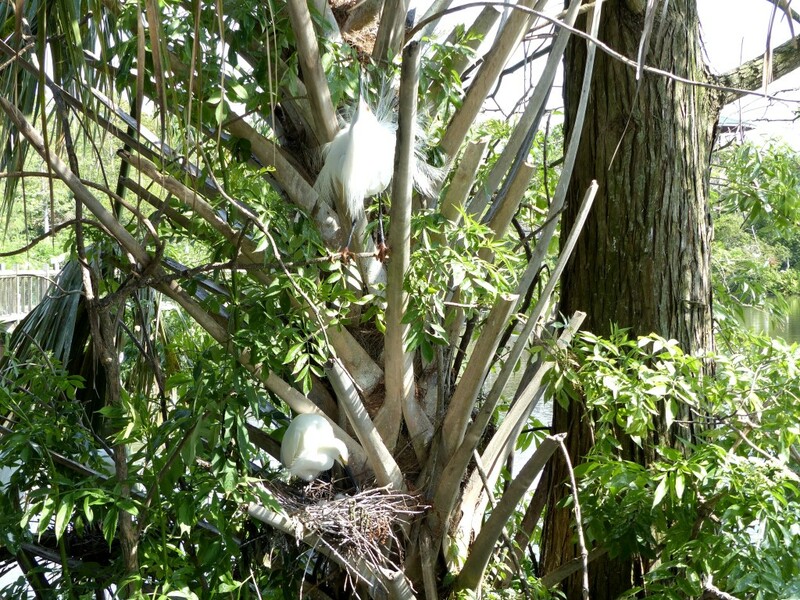 Regarding Egrets, see, e.g., Lee Dusing’s “Egrets and Heron Catching the Gator Taxis” as well as her “Baby Snowy Egrets at Gatorland”. Most times these alligators and birds get along fine. People are tossing food to them and so they abide each other. It is amazing how different critters get along. I can only imagine how it must have been when they were first created. 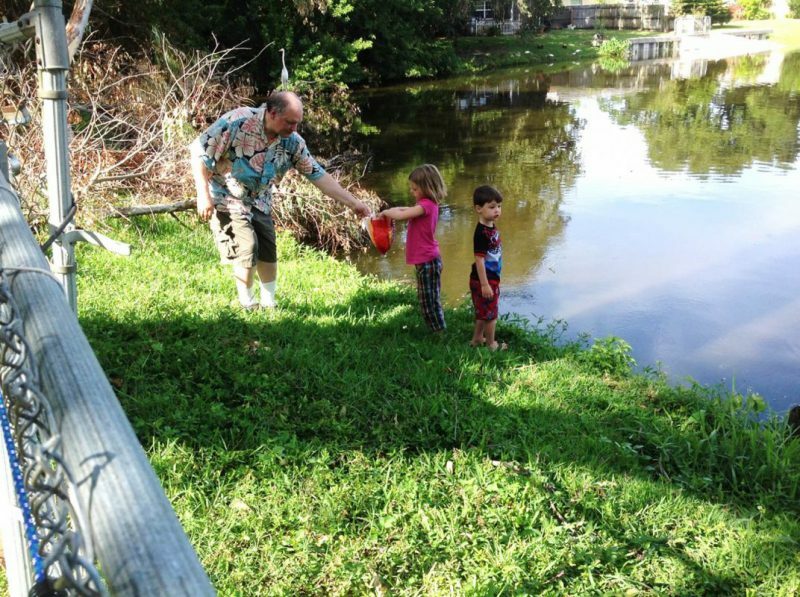 There was no desire of the gators to eat the birds. Today, under the curse, it is a totally different situation. 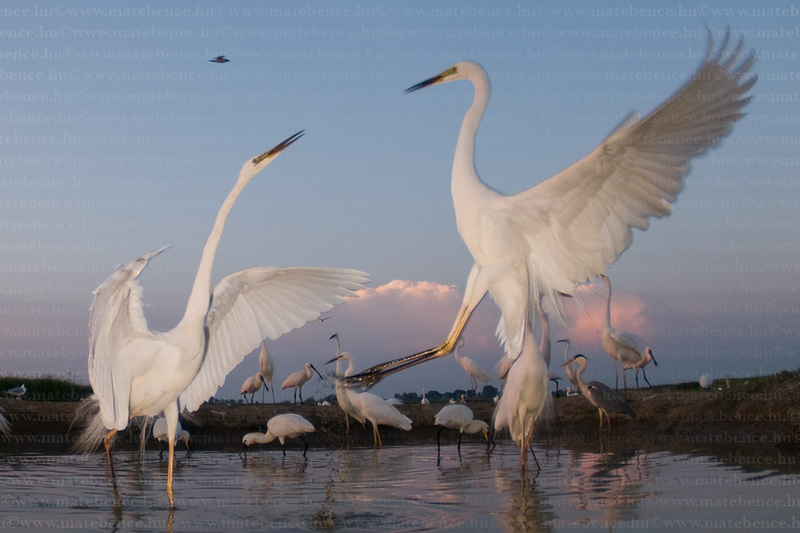 [Quoting Lee Dusing’s “Egrets and Heron Catching the Gator Taxis”, See also my report on how Cattle Egrets practice “mutual aid” with various terrestrial herbivores, in “Cattle Egrets, Cattle, and Other Herbivore Neighbors”. Since those egrets have been described, as just noted, previously, not much will be added here, regarding them, except for a few comments regarding their distribution, i.e., regarding the ranges they inhabit. 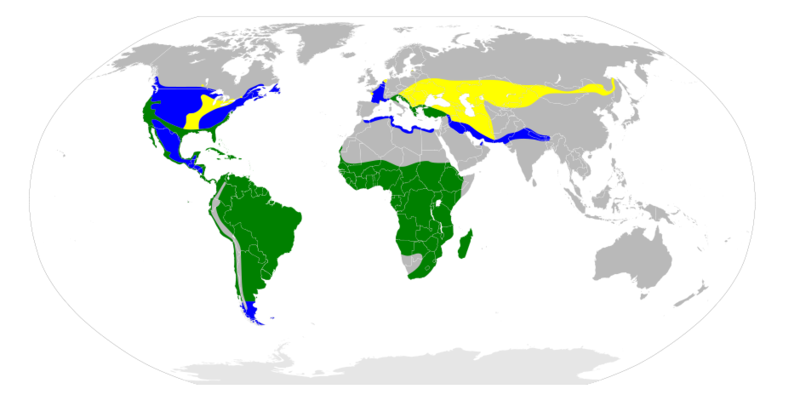 The Great White Egret (Ardea alba) is well-known in North America, as the range map below shows, but most of America only hosts this tall egret during the winter months. Breeding occurs mostly in the Mississippi River watershed corridor states, with a swath of the Southwest and southern coasts providing year-round habitat of this long-legged shorebird. A tall and stately bird, the Great [White] Egret slowly stalks shallow [waters of] wetlands looking for small fish [or frogs, or snakes, etc.] to spear [or grab] with its long sharp bill. 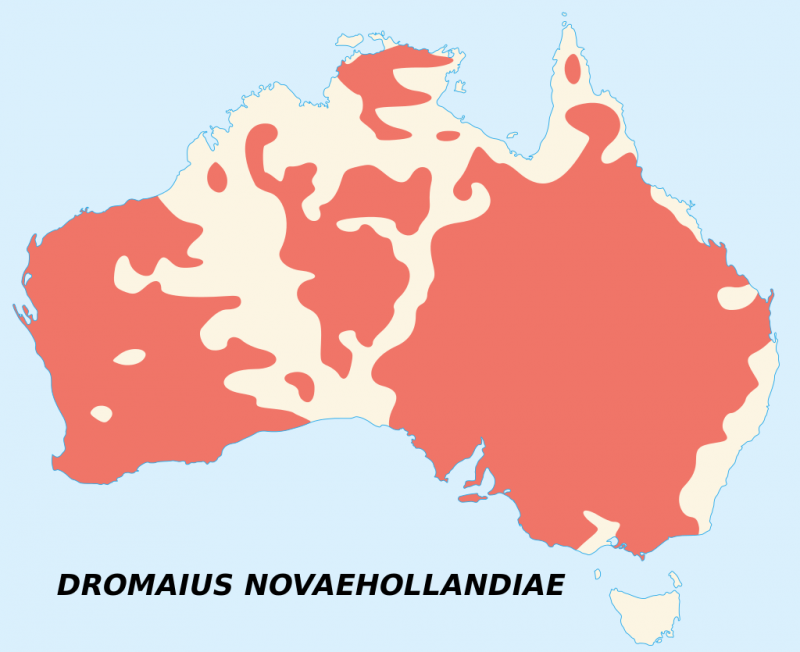 Nests in colonies of up to 100 birds. Now protected [legally], they were hunted to near extinction in the 1800s and early 1900s for their long white plumage. 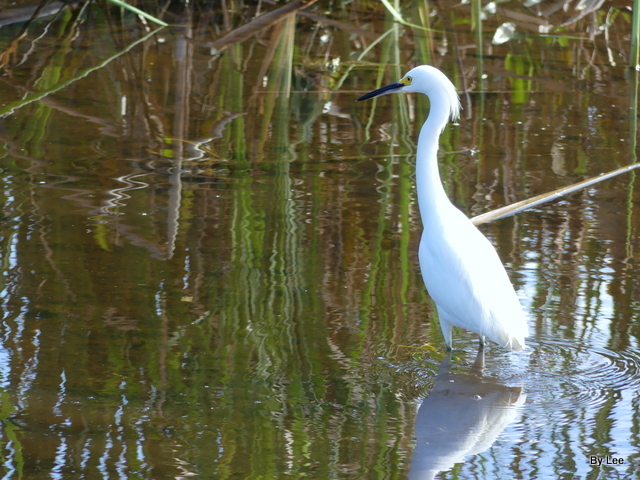 Another familiar white-feathered egret, in America, is the Snowy Egret. 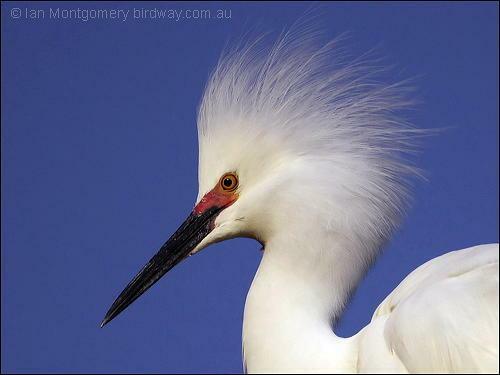 The Snowy Egret (Egretta thula) is a small-scale heron with snowy white plumage, famous for its “golden slippers”. 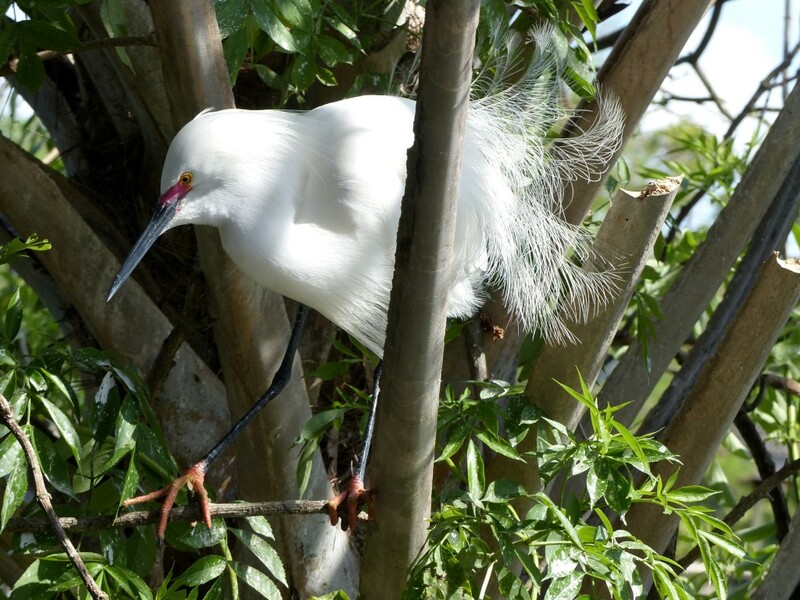 Like the resourceful Cattle Egret (mentioned above — see coverage of this wide-ranged and herbivore-helping egret,) the Snowy Egret is small in size, as herons and egrets go. 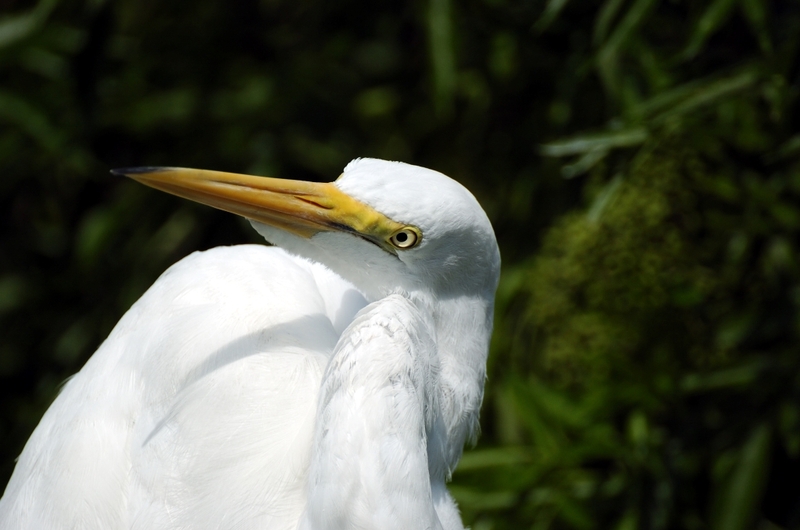 However, unlike the Cattle Egret, its feathers are all white, and its feet are a mustard-yellow (or goldenrod yellow) in color. 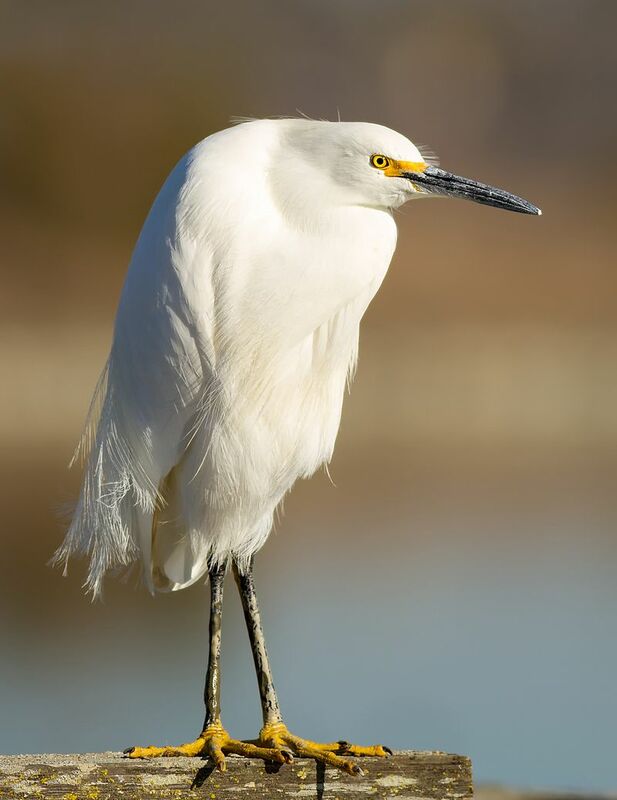 The Snowy Egret is a wetland bird – preferring swamps (including mangrove swamps), pondshores, marshlands (including saltmarshes), island shores, and estuaries (including tidal mudflats). 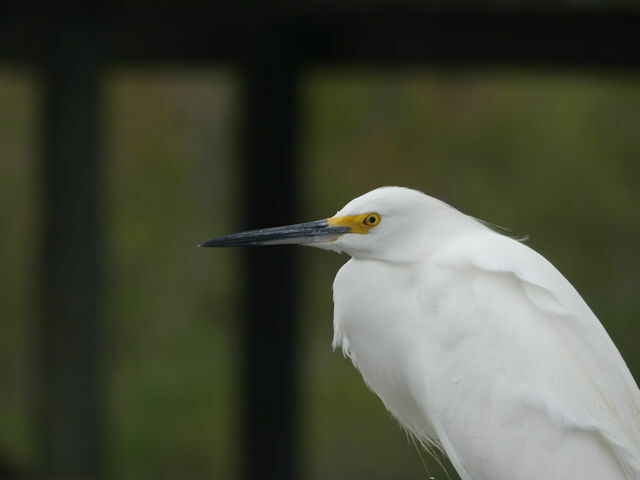 As shown below, the Snowy Egret has a breeding range that includes some patches of America, mostly in part of the Northwest and in the drainage basin of the Mississippi River. 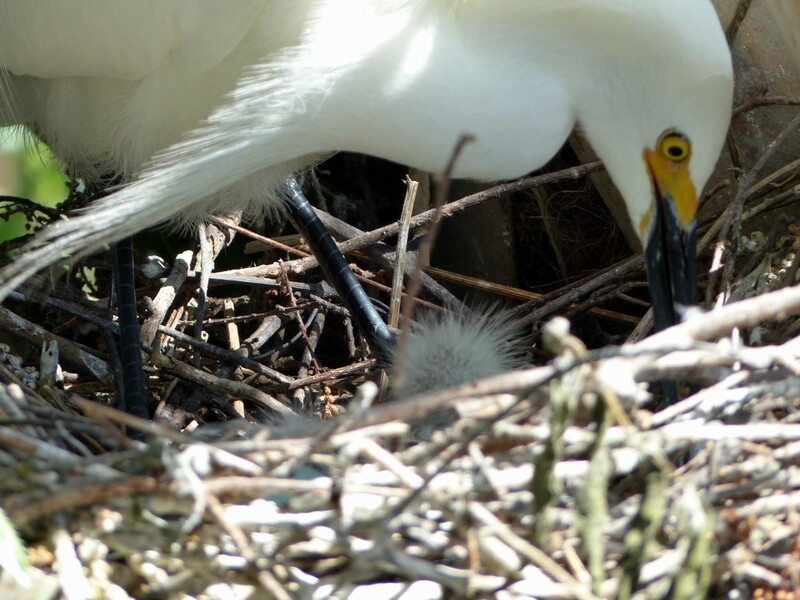 Also, the Snowy Egret is a year-round resident of America’s Atlantic coast and America’s Gulf of Mexico coast. 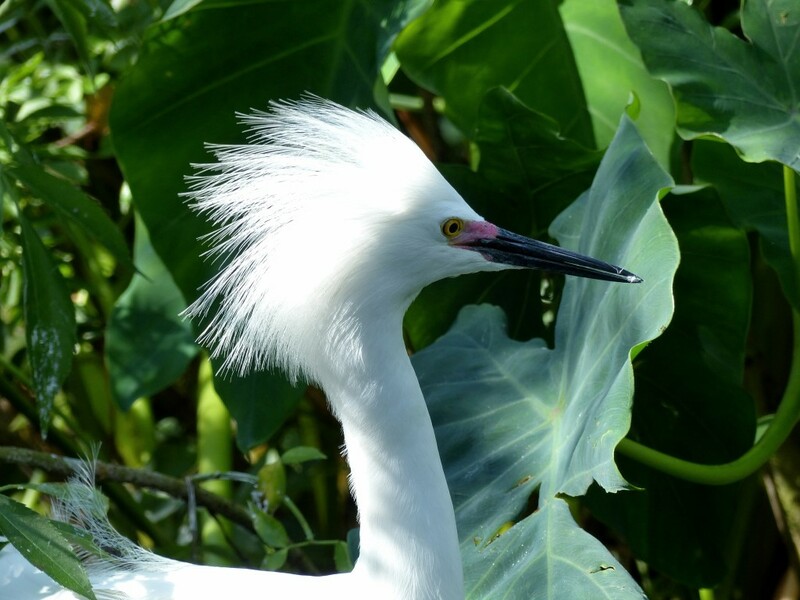 More than a century ago the Snowy Egret (as well as the Flamingo, the Roseate Spoonbill, various cranes, ducks, geese, swans, other members of the heron-egret family, doves, as well as insectivorous passerine migrants, etc.) was wastefully being hunted for its fancy feathers, jeopardizing the entire American population — until the Migratory Bird Treaty was enacted (and was enforced). Regarding the Migratory Bird Treaty’s historic importance, see “Looking Back 100 Years, at the Migratory Bird Treaty: A Bird’s-eye View of How It was Hatched”. Thankfully, populations of egrets (and other long-legged, long-necked birds, such as cranes, herons, flamingo, roseate spoonbill, ibis, etc.) 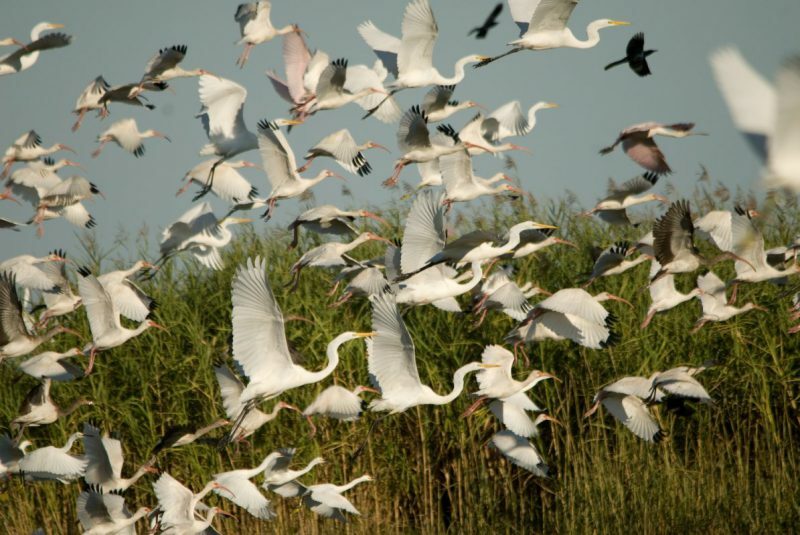 have rebounded, since passage (100 years ago) and enforcement of the Migratory Bird Treaty. 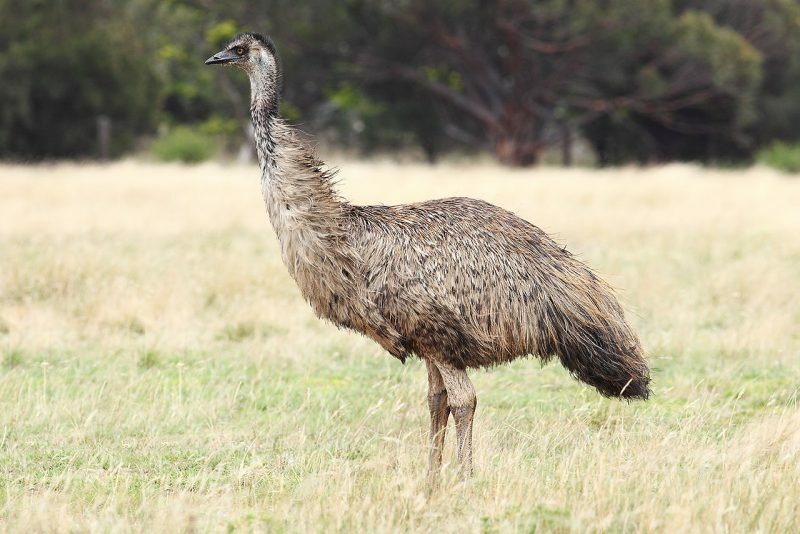 Regarding Australia’s Emu (as well as regarding other ratites, including the smallest ratite — New Zealand’s kiwi), see ornithology professor Lee Dusing’s “Sunday Inspiration: Ostrich, Rhea, Cassowary, Emu & Kiwi”. Also, for a close-up (albeit abrupt) perspective on an Emu, see “Lee’s Five Word Friday: 9/16/16”. The Emu is the second-largest (non-extinct) bird, by height; only the Ostrich is taller. By weight the Emu is the world’s third-largest bird, weighing less than the Ostrich and anther ratite “cousin”, the double-wattled Southern Cassowary. The Emu has an over-all height of about 180 cm. (70”); to the top of the back it measures about 100 cm. (40”); it can weigh up to 55 kg. (120 lbs.) and have a beak up to 12 cm. long (5”). The body is very bulky, the coloring of the plumage brownish. The feet have three toes [each]. … The nest [typically located in scrubby steppe grassland habitat] is a hollow in the ground near a shrub, and it is covered with leaves, grass, et cetera. Various females lay 15-25 eggs, which are incubated by the male for 52-60 days [during with time the male loses a lot of weight, due to not eating], depending on the interruptions made by the male to find food and water. 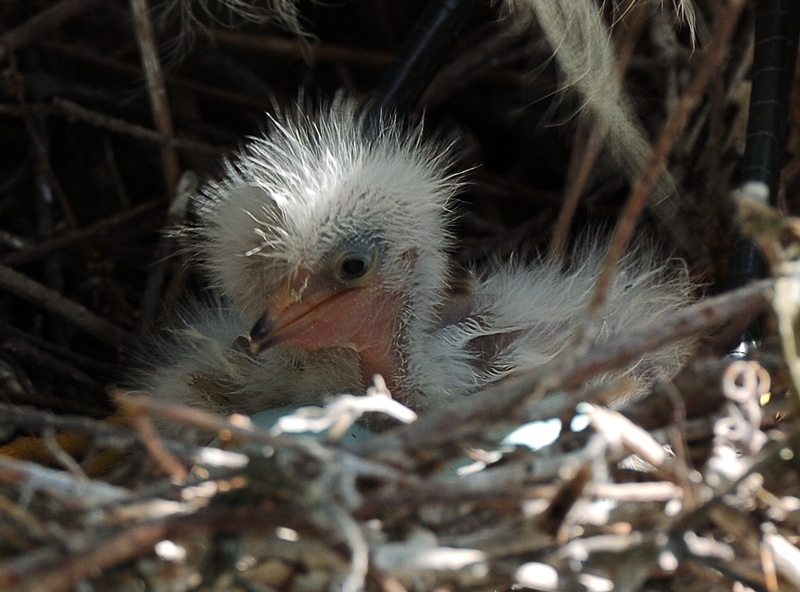 The nestlings, which have a distinctive white and brown-striped plumage, achieve complete development and sexual maturity within 2 or 3 years. The Emu can run at speeds of up to 50 kph. (30 mph.). In recent years I have observed, in the wild, many varieties of Egrets – especially Great White Egret, Snowy Egret, and Cattle Egret. Also, on a few occasions I have observed (very close up) domesticated Emus – and they are not fully “tame” even when they are “domesticated”. All of these birds, which range in size, are marvels in motion — examples of God’s super-genius bioengineering. Whenever we look at such feathered creatures, we should be amazed, and we should admire God’s handiwork, — because God has given us the ability to use our minds (which are somehow linked to the physical “hardware” of our heads, especially our eyes and brains). In a sense, we have such birds “on our heads”, as we think through the blessings God has given, due to Him creating such birds. So, if our minds are renewed to proper reverence of God, as the Creator of all creation (Revelation 4:11), our “heads” can empirically accept and analyze these visual blessings, as feathered exhibits displaying God’s glory. God willing, the next contribution to this alphabetic series will be some “F birds” – perhaps some of these: Fairywrens, Falcons, Fantails, Fernbirds, Fieldwrens, Figbirds, Finches, Firetails, Fiscals, Flamebacks, Flamingos, Flatbills, Flowerpeckers, Flycatchers, Foliage-gleaners, Forktails, Francolins, Friarbirds, Frigatebirds, Frogmouths, Fruiteaters, Fulmars, Fulvettas, etc.! Meanwhile, enjoy using your eyes (and the rest of your head) to appreciate the blessings and privileges of daily life, including opportunities to observe God’s avian wonders, like egrets and emus. 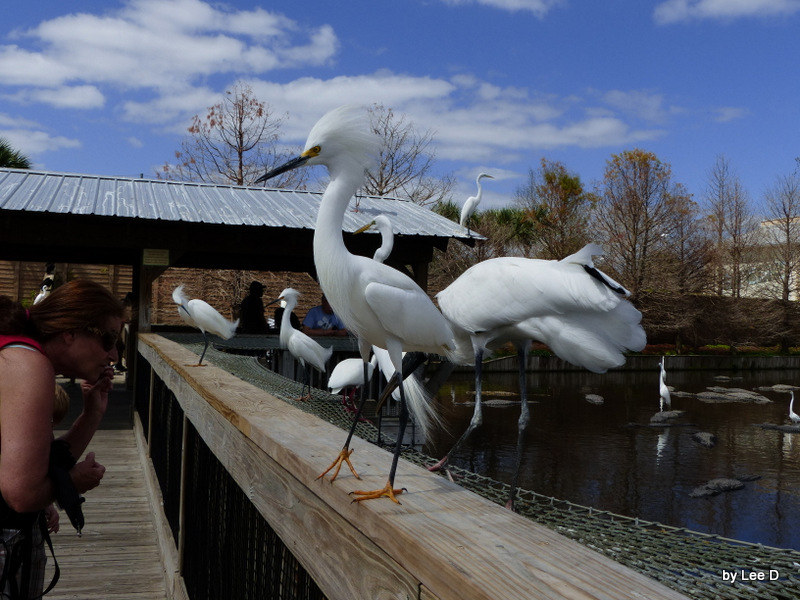 While we were at Gatorland, I had the delight to be able to get really close to a Snowy Egret. I was taking a photo of him when he got so close I couldn’t focus the camera. I backed the zoom out and realized just how close we were. 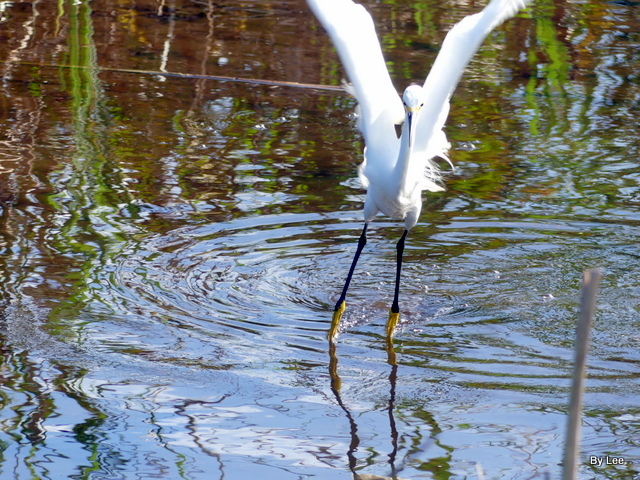 Snowy Egret stepped so close it blurred my shot. I tried to give my camera to Dan to get a photo of me and the Snowy. That spooked him and he flew off a few yards. I coached him back and thankful he came. This time I handed Dan my camera down low and he stayed put. 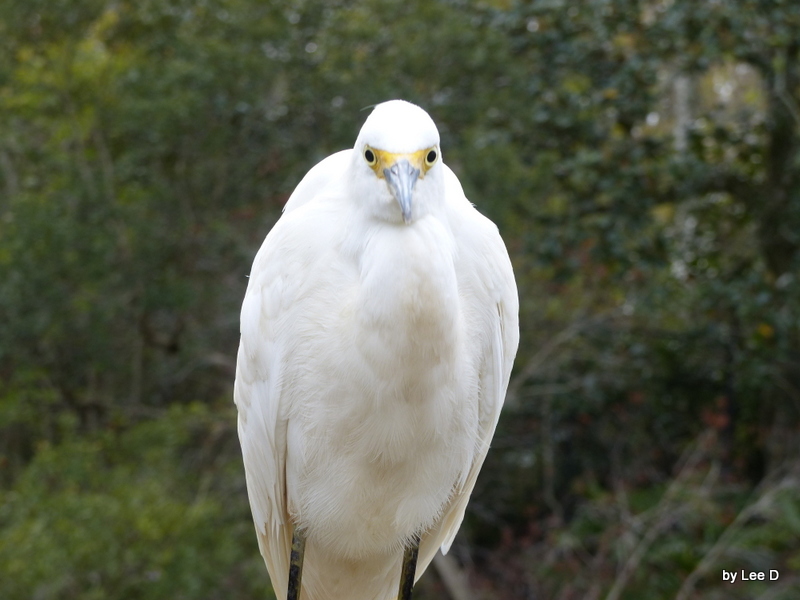 The following photos are what Dan took of the close encounter with my Snowy Egret friend. I could have touched the bird, if I had wanted, but have you ever seen that beak up close? Looked like a sharp needle from my point of view. I am very thankful that the Lord created such a neat bird and helped him not be afraid of me. I am glad the Lord lets us have joy from just watching His critters. Below is a combination of ten short videos from Gatorland. There are several of the Great Egrets on the nest, and one Great Egret displaying. 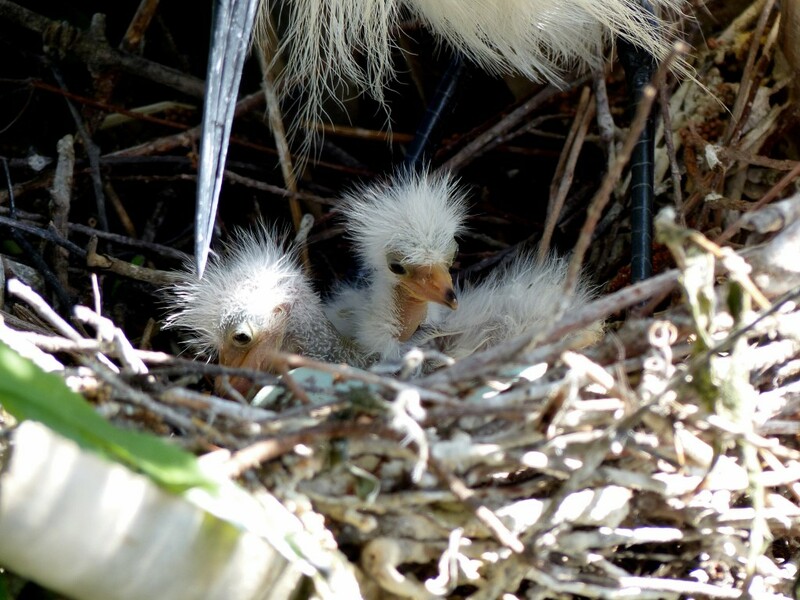 There were three Snowy Egrets youngsters in a nest and other happenings along the boardwalk. We trust you enjoy the photos and video. This is just a few of the photos taken.